This project was created on 02/21/2019 and last updated 2 months ago. I found very few solutions that would allow me to execute repetitive keyboard actions. It is something that could be useful when working with Lightroom or Photoshop in order to quickly reverse a few actions back and forth to visualize the result. All commercial items I found are task specific and not very customizable so I decided to build my own. By using the push button on the rotary encoder I should be able to switch between pre-defined shortcut and get a visual feedback using the Neopixel ring. I also want to make something accessible to anyone and easy to reproduce. A Trinket M0, EC11 rotary knob, a neopixel ring, a nicer knob and an aluminium case from audiophonics. The connections are quite straightforward. The A,B,C pin of the encoder are going to the pin 1,2 and 3 of the Trinket. Pin 4 is connected to the DI of the ring. 1. Turning on LEDs clockwise, turning off LEDs counterclockwise until one LED only is on. Stopping at LED of origin. This is for Undo/Redo actions with finite history. 2. Turning on LEDs clockwise, turning off LEDs countreclockwise but also turning on LEDs further counterclockwise if it passes the LED of origin. This is for volume up/down or any "unlimited" action. Reading the encoder: the trick is to trigger an action on interrupt to detect when the knob is turned. Therefore the main code will not be in the loop() function but rather in the function called on interrupt. Sending keyboard commands: I will be using the HID-Project Library. This is important to not use the default Keyboard.h library provided by Arduino because the HID library already includes it. The difference is that some actions are not just keyboard shortcut but requires to interact with the HID. The volume up/down is one of them for example and triggering F11/F12 will not work. Anything will work here but I stumble upon this aluminium case that I will re-purpose for the project. I will simply drill holes to mount the knob and be able to see the LEDs. I have attached a template to mark the holes. 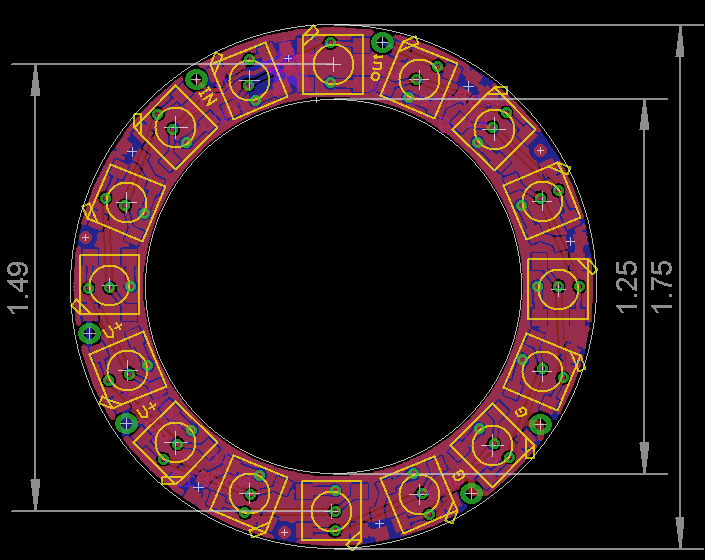 Turns out the wall of the casing is a tad too thick in order to fit the neopixel ring I just received. And I don&apos;t have access to a lathe, so I shaved off the 1mm excess with a coarse round file after mounting the casing on a drill. I clamped the portable drill on the bench for that and such filed the inside for 30-40mm. I then finished the surface with sandpaper. Can You show video how easy is playing in tempest game? Better than keyboard or mouse? Great job!. I like your idea of using epoxy as a light diffuser in the aluminum case. Hi Vincent! This looks like a useful tool, and could be a cool-looking add-on to the already existing keyboard. I&apos;m curious to see how this will work. A custom programmable tail light for my custom electric skateboard. You are about to report the project "The Infinity USB Knob", please tell us the reason.